I will lead with the fact that I understand WHY Lone Wolf has gone this way. This gets them Android devices, which is not insignificant in and of itself. The argument that it allows them to take HL forward to be more than just a character and statblock builder also makes sense. That said, I’m not thrilled with the decision for Starfinder to be HLO only (at least at release). While it’s true that they won’t be able to do things like group starship combat with HLC, that shouldn’t keep them from releasing the features that it can support. To be fair, they’re not saying they *won’t* support Starfinder in HLC, but they’re also pretty carefully not saying they will either. For this to work for me, Starfinder needs support for both HLO and HLC. Until it has both, I have no reason to subscribe. They do say that, ultimately, purchased content will work for both once legacy game systems are supported. It would help if they were pulishing some sort of timeline on when they expect legacy game systems to be supported. It’s also not clear to me how or if they will accommodate those that purchased additional secondary licenses. Additionally, it’s not clear if you will still be able to make use of custom user data files with HLO. If not, that’s gonna hurt for me, which encourages me to stick with HLC. So… for now at least, I’m going to hold off on adoption until there is Starfinder support in HLC. Hopefully more of my questions will be answered by then. It also means I am now less enthusiastic about running Starfinder, at least until it’s supported for both. One of the curses of being the GM is that you can have all sorts of great ideas for characters, but you rarely get to use them since you’re the GM. Sure, you can turn them into NPCs, but it’s just not the same. Android Monk (yes, I know, not terribly optimal) with the Apotheosis (Story) feat. This one has a name. I call him Rild. Goblin Gunslinger (Gun Scavenger) – Utini! Halfling Bard (Archaeologist) with all of the Halfling helper feats and Halfling Luck. Just need to get him a cigar, some sort of fancy hat, and a bullwhip. Starfinder design lead, Owen KC Stephens, has created and posted a one page quick reference that highlights some of the more major differences between Starfinder and Pathfinder. It’s been posted in the Paizo forums and can be found here: Starfinder Cheat Sheet. Sorry for the scattered brain dump posts like this, but if I don’t put this to bits, I’ll likely forget it later. Subtle difference between 3.x and Starfinder: Typically, you are only caught flatfooted when you are surprised in Starfinder. Previously, you were flatfooted if you were surprised, or until your first action in the round. As I said before, character generation is fairly straightforward. Pick a race, a theme, and a class. The combination of theme and class effectively is your class archetype (though it’s not called that). For example, Envoy plus the Outlaw theme can be a Scoundrel. These are, effectively, suggestions for how to build a type of character more so than an actual archetype. This combination is fairly versatile, and easily covers a lot of characters from fiction. Han Solo? Envoy/Outlaw. Chewie? More complicated but I would likely go with Soldier/Outlaw (an argument could be made for multi-classing). Luke? Solarian/Ace Pilot. I could totally do Jim Starlin’s Dreadstar with Starfinder. Vanth is so obviously a Solarian it’s not even funny. I can only guess what the various inspirations were to the creative team (I miss having a Bibliography like in GURPS books) but some of them are pretty obvious. Star Wars, Mass Effect (Biotics is basically space magic) and Guardians of the Galaxy are all pretty clear. Since the setting is tied to Golarion, there is a chapter for Legacy Races, such as Elves, Dwarves, etc. I’m not sure I’ve ever wanted to play a Half-Orc so badly as I do here. One of the more common choices for the Half-Orc is basically a professional pioneer. They go in do the hard work of taming the world, and then they sell their stake and move on to the next world. I think that’s it for now. I need to finish the tactical combat chapter and see what other changes they’ve made. If you’re a Pathfinder GM and you’re only going to purchase one single third party product, my recommendation would be this book right here. 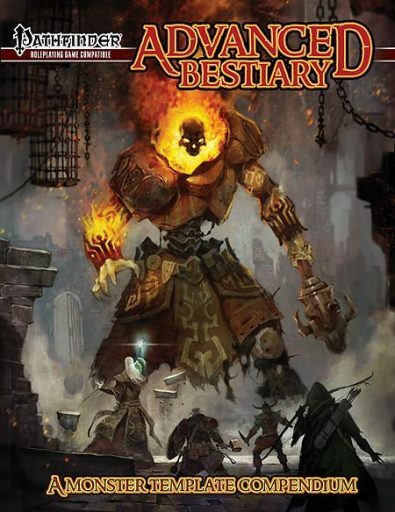 The Advanced Bestiary was originally released for D&D 3.0, and it was a good book but kind of got lost in the glut of 3.0 books that everyone was doing. However, it was getting regular use by the folks at Paizo on their early D&D 3.x adventure paths. This and Tome of Horrors were a mainstay in section 15 of their OGL listing. So, when Paizo decided to publish Pathfinder, it was only a matter of time before both the Advanced Bestiary and the Tome of Horrors were published as Pathfinder compatible. Both books are excellent, and I recommend both, but this post is focused on the Advanced Bestiary.